Trevor Noah, host of Comedy Central’s <em>The Daily Show</em>, will visit RIT’s Brick City Weekend on Saturday at the Gordon Field House. Several thousand Rochester Institute of Technology students, alumni and others are expected to watch RIT vs. Northeastern University in men’s hockey at 7:05 p.m. Saturday at Blue Cross Arena in downtown Rochester, just one of more than 100 activities planned for this year’s RIT Brick City Homecoming & Family Weekend. Free shuttle buses to and from the game will be available for students starting at 5 p.m. Saturday in the S Lot. Tickets to the game are $6 for RIT students, $9 for non-RIT students, $5 for children under 5 and $13 for everyone else, and available at the door or RITtickets.com. 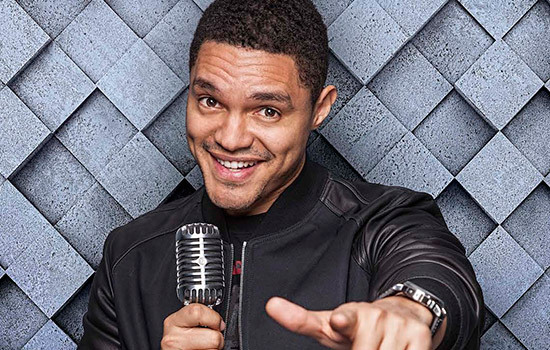 Another highlight of the weekend will be a visit from Trevor Noah, host of Comedy Central’s The Daily Show. Noah, who began his career as an actor, presenter and comedian in his native South Africa, will be appearing from 1 to 2 p.m. on Saturday at the Gordon Field House. Tickets, while they last, are $20, or $10 for RIT students at the Brick City Weekend website, https://www.rit.edu/brickcity, or at University Arenas Box Office. Sir Dermot Turing, the nephew of Alan Turing, is also scheduled to attend Brick City Weekend as guest of the College of Science and B. Thomas Golisano College of Computing and Information Sciences. He wrote a biography about his uncle, a mathematician, philosopher and computer scientist who was the subject of the film, The Imitation Game. The film will be shown in Ingle Auditorium at 9 p.m. tonight (Thursday, Oct. 12). Admission is free. Sir Turing’s talk will be at 12:15 p.m. Friday, Oct. 13, in Ingle Auditorium, followed by a book signing from 1:15-2 p.m. in the 1829 Room. Admission is free. Dawn Hudson, chief marketing officer for the NFL, will be the Saunders College of Business Gasser Lecture Series speaker at 2:30 p.m. Friday, Oct. 13. Her talk, in Ingle Auditorium, is sold out. The 2017 Presidents’ Alumni Ball will be held from 6:30 to 11 p.m. Friday, Oct. 13, in the Gordon Field House, with a reception, dinner and award ceremony honoring E. Philip Saunders, RIT Alumnus Brooks Bower ’74 (printing) and this year’s Distinguished Alumni Award winners. RIT President David Munson will share highlights of RIT’s recent accomplishments and offer insights on his early vision for the university at 9 a.m. Saturday, Oct. 14, in Ingle Auditorium. He will also answer questions. And returning this year are the popular Classes without Quizzes series. One featured class will be hosted by the Hon. Robert L. Wilkins, an RIT parent and U.S. Court of Appeals justice who will talk about his recent book, Long Road to Hard Truth: The 100-Year Mission to Create the National Museum of African American History and Culture. Two games with the RIT women’s hockey team are scheduled against Rensselaer Polytechnic Institute, for 4 p.m. Friday, Oct. 13, and 1 p.m. Saturday, Oct. 14, both at the Gene Polisseni Center. Admission is free for RIT students; $5 for parents and RIT guests; $4 for alumni, faculty and staff; and $3 for children under 12. Visit the Brick City Homecoming & Family Weekend website for a complete list and updates.